Before you go vacation in Thailand, the Thai passport checks happen here and there are the first characteristics of the beautiful country. Read more about it under immigration regulations. 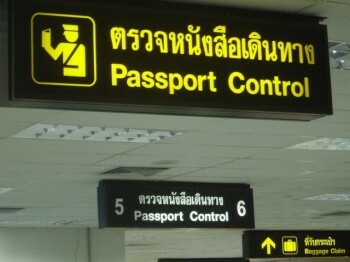 For in Thailand permanently residing foreigners believe that the Thai passport control system from time Time to unpleasant surprises, which generally inconvenience Can cost time and money. For All border crossings in principle on filling in the "Arrival Card" and "Departure Card". When the territory remains the "Arrival Card "at passport control and the" Departure Card "is, in the passport stapled. On the "Departure Card" is the authentic latest departure date stamped. This date should be exceeded in any case be! The Arrival card TM.6 is usually already distributed in the plane, and can then fill in peace be, otherwise there is this card before Passport control.